Guillaume Faye was one of the leading advocates of the French New Right in the 1970s and ’80s. After departing in 1986 due to his disagreement with its strategy, he had a successful career on French television and radio before returning to the stage of political philosophy as a powerful alternative voice with the publication of Archeofuturism. Since then he has continued to challenge the status quo within the Right in his writings, earning him both the admiration and disdain of his colleagues. 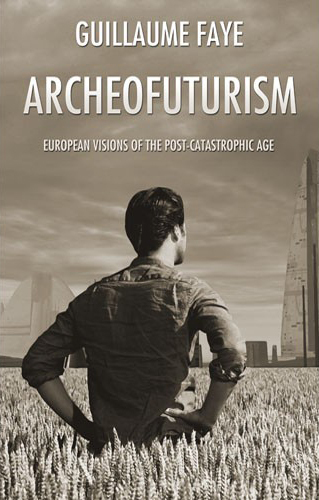 Archeofuturism is finally available in English. Faye believes that the future of the Right requires a transcendence of the division between those who wish for a restoration of the traditions of the past, and those who are calling for new social and technological forms — creating a synthesis which will amplify the strengths and restrain the excesses of both: Archeofuturism. Faye also provides a critique of the New Right; an analysis of the continuing damage being done by Western liberalism, political inertia, unrestrained immigration, and ethnic self-hatred. Faye prophesies a series of catastrophes between 2010 and 2020, brought about by the unsustainability of the present world order, which he asserts will offer an opportunity to rebuild the West and put Archeofuturism into practice on a grand scale. This book is a must-read for anyone concerned with the course that the Right must chart in order to deal with the increasing crises and challenges it will face in the coming decades. For an excerpt from Archeofuturism, click here . For Michael O’Meara’s Foreword to Archeofuturism, click here . For reviews of Archeofuturism click here .